This project has been carried out as an example of the "Quartz" partnership between Wordsmithcrafts and St Johns Dumfries. these projects seek to help people develop their ability to explore Spirituality and discuss it as well as the contribution a spiritual life makes to the community and personal growth.. Throughout this to help them reflect on the contribution the arts make to spiritual development. This page contains links to edited highlights from the logs which participants kept of their activities. Each participant also kept records of the time, materials and other resources required to develop their artwork. This formed a basis for them to work out how much they would have sell- and what sort of things to choose to make - in order to guarantee themselves a reasonable income and test the financial viability of running a creative business. 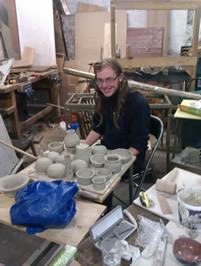 Sam decided to work with ceramics, he also used his background as a volunteer re-enactor to help develop the Largs Labyrinth experience. He kept a blog diary which you can look at here. Remember to scroll down so that you can see the dustbin firing experiment! Jamie became involved at the end of 2014 and has continued the project activities into 2015. Jamie worked mainly in wood. His involvement in community arts has included working in Schools with textiles as well as helping the pupils understand the life of a woodsmith. View excerpts from his V-log here! Simon came up with the idea for the project and kept a blog too. This page also has an insight into the preparation for the project, and a report written at the end of the year.